Brown University is a private university located in Providence, Rhode Island. Founded in 1764, as Rhode Island College, it is the third-oldest institution of higher education in New England and the seventh-oldest in the United States. It is a member of the Ivy League. People associated with the University are known as "Brunonians." Originally established as an institution for educating men, the first women were admitted in 1891, with the establishment of the Women’s College, later known as Pembroke College. Brown became coeducational in 1971 by merging with Pembroke College. Non-sectarian in spirit from its founding, Brown was the first college in the nation to accept students of all religious affiliation. The school also has the oldest undergraduate engineering program in the Ivy League (1847). 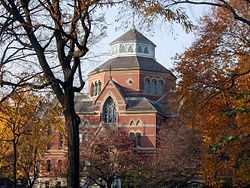 Brown, together with Princeton University, are the only Ivy League schools that do not have a law school or business school. According to a 2007 Princeton Review survey of colleges, Brown was the fourth most selective college in America, and Brown's students were the happiest. Students design a multidisciplinary program of study, based on the principle that "the individual who is being educated is the center of the educational process." Supporting the development of individual style and uniqueness, Brown has generated traditions that reflect a spirit of happy eccentricity. Students are prepared to discharge the "Offices of Life" in whatever form they choose, guided by their conscience. Graduates of Brown have a very high acceptance rate into graduate programs of their choice in law, medicine, business; Brown alumni have been successful in a wide range of areas, including politics, entertainment, literature, and athletics. Brown University seal as a detail on a university building. In 1763, James Manning, a Baptist minister, was sent to Rhode Island by the Philadelphia Association of Baptist Churches in order to found a college. At the same time, local Congregationalists, led by James Stiles, were working toward a similar end. On March 3, 1764, a charter was filed to create Rhode Island College in Warren, Rhode Island, reflecting the work of both Stiles and Manning. The charter had more than 60 signatories, including John and Nicholas Brown of the Brown family, who would give the College its present day name. The college's mission, the charter stated, was to prepare students "for discharging the Offices of Life" by providing instruction "in the Vernacular Learned Languages, and in the liberal Arts and Sciences." The charter's language has long been interpreted by the university as discouraging the founding of a business school or law school. Brown continues to be one of only two Ivy League colleges with neither a business school nor a law school (the other being Princeton University). The charter required that the makeup of the board of thirty-six trustees include twenty-two Baptists, five Friends, four Congregationalists, and five Episcopalians, and by twelve Fellows, of whom eight, including the President, should be Baptists "and the rest indifferently of any or all denominations." It specified that "into this liberal and Catholic institution shall never be admitted any religious tests, but on the contrary, all the members hereof shall forever enjoy full, free, absolute, and uninterrupted liberty of conscience." The Encyclopedia Britannica Eleventh Edition remarks that "At the time it was framed the charter was considered extraordinarily liberal" and that "the government has always been largely non-sectarian in spirit." Hope College (left) was built in 1822, while Manning Hall (right) was built in 1834. Brown was founded by the Baptist church in 1764 as Rhode Island College. James Manning, the minister sent to Rhode Island by the Baptists, was sworn in as the College's first president in 1765. Rhode Island College moved to its present location on College Hill, in the East Side of Providence, in 1770 and construction of the first building, The College Edifice, began. This building was renamed University Hall in 1823. The Brown family — Nicholas, John, Joseph and Moses — were instrumental in the move to Providence, funding and organizing much of the construction of the new buildings. The family's connection with the college was strong: Joseph Brown became a professor of Physics at the University and John Brown, served as treasurer from 1775 to 1796. In 1804, a year after John Brown's death, the University was renamed Brown University in honor of John's nephew, Nicholas Brown, Jr., who was a member of the class of 1786 and contributed $5,000 (which, adjusted for inflation, is approximately $61,000 in 2005, though it was 1,000 times the roughly $5 tuition) toward an endowed professorship. In 1904, the John Carter Brown Library was opened as an independent historical and cultural research center based around the libraries of John Carter Brown and John Nicholas Brown. The Brown family was involved in various business ventures in Rhode Island, including the slave trade; the family itself was divided on the issue. John Brown had unapologetically defended slavery, while Moses Brown and Nicholas Brown Jr. were fervent abolitionists. In recognition of this history, the University established the University Steering Committee on Slavery and Justice in 2003. Brown was the first college in the nation to accept students regardless of religious affiliations. Brown began to admit women when it established a Women's College in 1891, which was later named Pembroke College. "The College" (the undergraduate school) merged with Pembroke College in 1971 and became coeducational. In 2001, Ruth J. Simmons became the first female president of Brown, and the second female president of an Ivy League institution. Robinson Hall, now home to the Department of Economics, was the main university library in the 1800s. Brown adopted the New Curriculum in 1969, marking a major change in the University's institutional history. The curriculum was the result of a paper written by Ira Magaziner and Elliot Maxwell, "Draft of a Working Paper for Education at Brown University." The paper came out of a year-long Group Independent Studies Project (GISP) involving 80 students and 15 professors. The group was inspired by student-initiated experimental schools, especially San Francisco State College, and sought ways to improve education for students at Brown. The philosophy they formed was based on the principle that "the individual who is being educated is the center of the educational process." In 1850, Brown President Francis Wayland wrote: "The various courses should be so arranged that, insofar as practicable, every student might study what he chose, all that he chose, and nothing but what he chose." The paper made a number of suggestions for improving education at Brown, including a new kind of interdisciplinary freshman course that would introduce new modes of inquiry and bring faculty from different fields together. Their goal was to transform the survey course, which traditionally sought to cover a large amount of basic material, into specialized courses that would introduce the important modes of inquiry used in different disciplines. The University simplified grades to ABC/No Credit, eliminating pluses, minuses and D's. Furthermore, "No Credit" would not appear on external transcripts. Except for the Modes of Thought courses, a key component of the reforms which have been discontinued, these elements of the New Curriculum are still in place. Additionally, due to the school's proximity and close partnership with the Rhode Island School of Design (RISD), Brown students have the ability to take up to four courses at RISD and have the credit count towards a Brown degree. Likewise, RISD students can also take courses at Brown. Since the two campuses are effectively adjacent to each other, the two institutions often partner to provide both student bodies with services (such as the local Brown/RISD after-hours and downtown transportation shuttles). Recently, there has been some debate on reintroducing plus/minus grading to the curriculum. 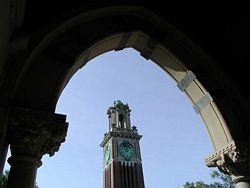 Advocates argue that adding pluses and minuses would reduce grade inflation and allow professors to give more specific grades, while critics say that this plan would have no effect on grade inflation while increasing unnecessary competition among students and violating the principle of the New Curriculum. The University is currently in the process of broadening and expanding its curricular offerings as part of the "Plan for Academic Enrichment." The number of faculty has been greatly expanded. Seminars aimed at freshmen have begun to be offered widely by many departments. In the fall of 2004, billionaire Sidney Frank, who could only afford to attend Brown for one year in his youth, donated an additional $100 million exclusively for financial aid—the largest gift in the university's history. Earlier that year, Frank had given $20 million for the construction of Sidney Frank Hall, the future home of Brown's fast-growing Department of Cognitive and Linguistic Sciences. However, in late May of 2006, it was announced that these funds would be repurposed for in progress projects and the almost completed Life Sciences Building would be renamed in honor of the recently deceased Sidney Frank. Planning for the now-unnamed Cognitive and Linguistic Sciences building is still underway, with the assumption that a new donor or donors will emerge in the near future. In September 2005, Frank made yet another donation of $5 million to aid Brown in providing free tuition for New Orleans students whose colleges had been rendered unusable by Hurricane Katrina just weeks earlier. His donations are one part of Brown's new capital campaign, dubbed "Boldly Brown," to raise $1.4 billion over the next three years, $600 million of which will go towards expanding the school's endowment. Brown parents also serve as large donors, and in 2004 gave more than any other group of non-alumni parents in the Ivy League and the second-most in the country (behind Duke University). The statue of Marcus Aurelius has watched over Lincoln Field since the turn of the twentieth century. Brown is the largest institutional landowner in Providence with property in the East Side and the Jewelry District. Brown's main campus is located atop College Hill, in the East Side, across the Providence River from downtown Providence. The main campus consists of 235 buildings and covers 143 acres. The East Side is home to the largest remaining collection of historic colonial homes in the country. The College Hill Historic District is designated on the National Register of Historic Places. In addition, six of Brown's buildings are listed on the National Register of Historic Places: Corliss-Brackett House, Gardner House, Hoppin House, Ladd Observatory, Nightingale-Brown House, and University Hall which was at least partially built by slave labor. The last two are also designated as National Historic Landmarks. Adjacent to Brown's main campus, and further down the Hill to the west by the Providence River, is the campus of the Rhode Island School of Design. Thayer Street, which runs through Brown's campus, is a commercial district that hosts many restaurants and shops popular with students and faculty from Brown and RISD. Also on the Hill, but further to the south and away from the main campus area, is Wickenden Street, another commercial district offering restaurants and shops. Brown Stadium, built in 1925 and home to the football team, is located approximately a mile to the northeast of the main campus. More recently, Brown has expanded into the Jewelry District, located in southern downtown Providence, by acquiring and renovating five buildings to serve as administrative and research facilities. Outside of Providence, Brown also owns a 376-acre property, the Mount Hope Grant, in Bristol, which is the setting of the Haffenreffer Museum of Anthropology. The College and the Graduate School are by far the largest parts of the school, spanning 100 undergraduate concentrations (majors), over 50 graduate school programs, and offering around 2,000 courses each year. Founded in 1847, Brown has the oldest undergraduate engineering program in the Ivy League. The most popular undergraduate concentrations are Biology, History, and International Relations. Brown is one of the few schools in the United States with a major in Egyptology or "History of Math." Undergraduates can also design an independent concentration if the existing standard programs do not fit their interests. The Brown "New Curriculum," instituted in 1969, eliminates distribution requirements and mandatory A/B/C grade (allowing any course to be taken on a "satisfactory/no credit" basis). Moreover, there are no pluses (+) or minuses (-) in the grading system. Carrie Tower was erected in 1904, a gift of Paul Bajnotti of Turin, Italy, and a memorial to his wife, born Caroline Mathilde Brown, granddaughter of Nicholas Brown (Class of 1786), for whom the University is named, and daughter of Nicholas Brown (Class of 1811). The University's medical program started in 1811, but the school was suspended by President Wayland in 1827. In 1975, the first M.D. degrees of the modern era were awarded to a graduating class of 58 students. In 1984, Brown endorsed an eight-year medical program called the Program in Liberal Medical Education (PLME). The majority of openings for the first-year medical school class are reserved for PLME students. Each year, approximately 60 students matriculate into the PLME out of an applicant pool of about 1,600. In addition, Brown offers a joint program with Dartmouth Medical School called the Brown-Dartmouth Medical Program. Approximately 15 students at Dartmouth Medical School enroll in this program annually. They spend the first two basic medical science years at Dartmouth and the next two years in clinical education at Brown, where they receive their M.D. degree. 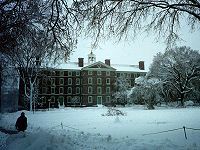 In June 2005, however, the deans of both schools announced that the Brown-Dartmouth program would accept its final class in the fall of 2006, stating that the institutions desired to move in their own directions. Several other admission pathways exist. The Early Identification Program (EIP) encourages Rhode Island residents to pursue careers in medicine by recruiting sophomores from Providence College, Rhode Island College, the University of Rhode Island, and Tougaloo College to BMS. In 2004, the school once again began to accept applications via the "standard route," from pre-medical students at any college or university. For the Class of 2009, nine students were accepted via this route. BMS also offers combined degree programs leading to the M.D./Ph.D. or M.D./M.P.H. degrees. In 2006, Princeton Review ranked Brown first among all American colleges for "happiest students." Brown was named "the most fashionable school in the Ivy League" in 2004 by the fashion trade journal Women's Wear Daily on the basis that students on campus seem to have the strongest sense of personal style. Brown is home to an active on-campus nightlife. A wide array of parties take place on the weekends, most of them in dorms and off-campus houses. Greek life is restricted to a fraction of the Brown student body, though they do take the spotlight during the annual Spring Weekend. Some parties are annual occurrences. Brown is a member of the National Collegiate Athletic Association (NCAA) Division I Ivy League athletic conference. It sponsors 37 varsity intercollegiate teams. Its athletics program has been featured in the College Sports Honor Roll as one of the top 20 athletic programs in the country according to U.S. News & World Report. Brown Women's Rowing Team has won 4 national titles in the last 10 years and Brown Football won the 2005 Ivy League Championships. Brown's Men's Soccer program is consistently ranked in the top 25, has won 18 Ivy League titles overall, and 8 of the last 12. 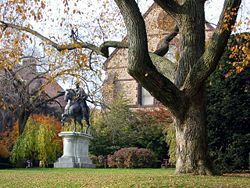 Brown's Varsity Equestrian team won the Ivy League Championships for the past two years in a row, and has consistently performed extremely well within the team's zone and region. Brown also features several competitive intercollegiate club sports, including its nationally ranked sailing, Taekwondo, and Ultimate teams. In 2005, the men's ultimate team, Brownian Motion, won the national championship, and the football team won its first-ever outright Ivy League title. There are approximately 240 registered student organizations on campus with diverse interests. 12.7 percent of Brown students are in fraternities or sororities. There are eleven residential Greek houses: six all-male fraternities (Alpha Epsilon Pi, Delta Tau, Delta Phi, Theta Delta Chi, Sigma Chi, and Phi Kappa Psi), two sororities (Alpha Chi Omega and Kappa Alpha Theta), two co-ed fraternities (St. Anthony Hall and Zeta Delta Xi), and a co-ed literary society (Alpha Delta Phi). All recognized Greek letter organizations live on-campus in University-owned dorm housing. Ten of the houses are overseen by the Greek Council and are located on Wriston Quadrangle. St. Anthony Hall, a co-ed fraternity that does not participate in Greek Council, is located in King House. Greek letter organizations that "discriminate on the basis of race" are not sanctioned, forcing groups like the Alpha Phi Alpha Fraternity, an African American fraternity, to operate off-campus. An alternative to fraternity life at Brown are the program houses, which are organized around various themes. As with Greek houses, the existing residents of each house take applications from students, usually at the start of the Spring semester. Examples of program houses include: Buxton International House, the Machado French/Spanish House, Art House, Technology House, Harambee House, Culinary Arts (Cooking) House, West House, and Interfaith House. 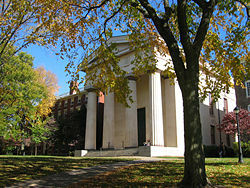 As at most other Ivies, secret societies have existed at Brown since the mid-eighteenth century. They originated as literary clubs and organized disputes among their members, a forensic tradition that continues today in the Brown Debating Union. The first known literary society was Athenian at Queen's, founded in 1776, but this group disbanded by the mid-1780s. The Philermenian Society (founded as the Misokosmian Society) arose in 1794. In reaction to the Federalist Philermenians, a Democratic-Republican society called the United Brothers Society was formed in 1806. In 1824, a third society, the Franklin Society, was formally recognized by the university president, and counted as honorary members Thomas Jefferson, John Quincy Adams, and Henry Clay. The Franklin Society was later renamed Pacifica House. All of these societies had libraries and meeting rooms on the top floor of Hope College, and few written documents were preserved in order to protect against inter-society espionage. However, by the mid-nineteenth century, these organizations diminished on account of the growth in the number of Greek letter fraternities. Though the early history of Brown's traditions as a men's school includes a number of unusual hazing traditions, the University's present-day traditions tend to be non-violent while maintaining the spirit of eccentricity. The Van Wickle Gates, dedicated on June 18, 1901, have a pair of center gates and a smaller gate on each side. The side gates remain open throughout the year, while the center gates remain closed except for two occasions each year. 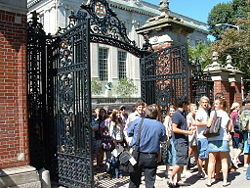 At the beginning of the academic year, the center gates open inward to admit students during Convocation. At the end of the second semester, the gates open outward for the Commencement Day procession. A traditional superstition is that students who pass through the gates for a second time before graduation do not graduate. Undergraduate members of the Brown Band, who must pass through the gates during the Commencement ceremonies walk through it backwards. Formerly, the graduation superstition only applied to male students, as female students had their own fear of never marrying. Similar superstitions apply to the Pembroke seal on the stone steps leading to the Pembroke quad from Meeting Street, a holdover from when Pembroke College was a separate college for women. Another traditional superstition is that students rub the nose of the statue of John Hay in the John Hay Library for good luck on exams, a superstition that has been in effect since around 1910, resulting in a very shiny nose. One of Brown's most notable traditions is keeping alive the spirit and accomplishments of Josiah S. Carberry, the fictional Professor of Psychoceramics (the equally fictional study of cracked pots), who was born on a University Hall billboard in 1929. He is the namesake of "Josiah's," a University-run snackbar. "Josiah" is also the name of the University's electronic library catalog. According to Encyclopedia Brunoniana, "on Friday, May 13, 1955, an anonymous gift of $101.01 was received by the University from Professor Carberry to establish the Josiah S. Carberry Fund in memory of his 'future late wife.' A condition of the gift was that, henceforth, every Friday the 13th would be designated 'Carberry Day,' and on that day friends of the University would deposit their loose change in brown jugs to augment the fund, which is used to purchase 'such books as Professor Carberry might or might not approve of.'" Students have followed this tradition ever since, and the fund currently has over $10,000 in it. "Professor Carberry has been the subject of articles in a number of periodicals, including the New York Times, which proclaimed him 'The World’s Greatest Traveler' on the front page of its Sunday travel section in 1974, and in Yankee magazine, where he was 'The Absent-Bodied Professor' in 1975. A recent honor which came to Professor Carberry was the award to him of an Ig Noble Prize at the First Annual Ig Noble Prize Ceremony on October 3, 1991. At this event sponsored by M.I.T. and the Journal of Irreproducible Results, Carberry, the 1991 Ig Nobel Interdisciplinary Research Prize laureate, was cited as 'bold explorer and eclectic seeker of knowledge, for his pioneering work in the field of psychoceramics, the study of cracked pots.'" Starting in 1950, Brown replaced the traditional Junior Week and Junior Prom, which were discontinued during World War II, with Spring Weekend, which featured athletic contests and dances. Concerts featuring invited performers began in 1960. In the past, it has brought in acts such as Ray Charles (1962, 1970), The Isley Brothers (1963), Bob Dylan (1964, 1997), The Coasters (1964), Ella Fitzgerald (1965), Bo Diddley (1965, 1997), The Shirelles (1965), Dizzy Gillespie (1968), James Brown (1968), Smokey Robinson (1969), Janis Joplin (1969), Bonnie Raitt (1972, 1978), Ike and Tina Turner (1972), Blue Öyster Cult (1972), Phil Ochs (1974), Bruce Springsteen (1974), and Charles Mingus (1977). Brown alumni have gone on to success in many disparate fields including politics, entertainment, literature, and athletics. Some notable examples include: Marvin Bower, founder of the consulting firm McKinsey & Compnay; philanthropist John Davison Rockefeller Jr; media mogul Ted Turner; Nathanael West, author of such works as Miss Lonelyhearts and The Day of the Locust; John F. Kennedy Jr.; and Joe Paterno, coach of the Penn State football team. ↑ Walter C. Brunson, The History of Brown University, 1764-1914 (1972), 500. ↑ Encyclopedia Britannica, 1911, Providence. Retrieved December 28, 2007. ↑ Ricardo Howell (2001, July), Slavery, the Brown Family of Providence and Brown University, Brown University News Service. Retrieved December 2, 2007. ↑ Brown University Admission, |title= Get to Know Us: Our History. Retrieved November 19, 2008. ↑ The Princeton Review (2006, August), Quality of Life, The Best 361 Colleges. Retrieved December 2, 2007. ↑ Sara Perkins (2004, April 19), Fashion Journal likes what Brown is wearing, The Brown Daily Herald. Retrieved December 2, 2007. ↑ U.S. News & World Report (2002, March 18), College Sports: Honor Roll, U.S. News & World Report. Retrieved December 2, 2007. ↑ Martha Mitchell (2003), Philermenian Society, Encyclopedia Brunoniana. Retrieved December 2, 2007. ↑ Martha Mitchell (2003), United Brothers Society, Encyclopedia Brunoniana. Retrieved December 2, 2007. ↑ Martha Mitchell (2003), Franklin Society, Encyclopedia Brunoniana. Retrieved December 2, 2007. ↑ "History of the Society of the Pacifica House." Franklin Society Records II. Box MS-1Q-F2, John Hay Archives of Brown University, John Hay Library, Providence, RI. ↑ Martha Mitchell (2003), Fraternities, Encyclopedia Brunoniana. Retrieved December 2, 2007. ↑ Dan Poulson (2001, March 1), Investigating the death of campus traditions, The Brown Daily Herald. Retrieved December 2, 2007. ↑ Martha Mitchell (2003), Van Wickle Gates, Encyclopedia Brunoniana. Retrieved December 2, 2007. ↑ 15.0 15.1 Brown Admissions, Brown Traditions. Retrieved December 2, 2007. ↑ Martha Mitchell (2003), "Carberry, Josiah S., Encyclopedia Brunoniana. Retrieved December 2, 2007. ↑ Martha Mitchell (2003), Spring Weekend, Encyclopedia Brunoniana. Retrieved December 28, 2007. ↑ Brown Concert Agency, A History of Spring Weekend. Retrieved December 2, 2007. Brunson, Walter C. 1972. The History of Brown University, 1764-1914. Kittay, Matthew R., Omid Gohari, Adam Burns, Kimberly Moore, and Jaime Myers. 2006. Brown University Ri 2006 (Off the Record) College Prowler. ISBN 978-1427400284. Michigan Historical Reprint Series. 2005. History of Brown University, with Illustrative Documents Scholarly Publishing Offices. ISBN 978-1425552176. This page was last modified on 6 July 2016, at 22:41.